Life will never be the same for Siddharth when he starts living next door to Alise. Nine-year old Siddharth is the despair of his parents. He does not want to run around or climb trees, and he is terrified of ants. Siddharth prefers books to friends and is the target of his teacher’s gimlet eyes in school because he asks too many questions. Then one day, when he is sent out to the garden to try and play, he finally makes a friends with the fast-talking, quick-thinking, ultra-intelligent baby elephant, Alise. Together the two friends set out on a series of exploits. From the day Alise decides to go to school wearing a checked tablecloth and ends up causing mayhem to the night they attend a party and get into such trouble that they run away to the forest, there is never a dull moment in Siddarth’s life. But the friends don’t stop at just having fun. The Bearded Bandit has spread terror among the elephants in the forest and someone has to stop him! 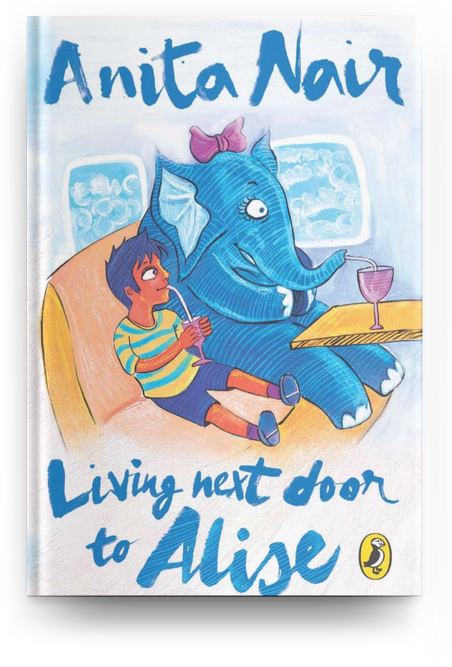 A rollicking story of friendship and bravery, Living Next Door to Alise will have you laughing out loud and waiting for a friend like Alise to move in next door!